Robert Thurman illuminates the Tibetan Book of the Dead with up-to-date insights for modern audiences. For centuries, this text has been read aloud to the dying, who Buddhist masters say are capable of hearing up to three days after clinical death, as a guide through the tumultuous and often terrifying process of dissolution. Now, in Liberation Upon Hearing in the Between, Professor Robert Thurman demystifies this esoteric teaching and reveals the Tibetan view of dying. It is said that the practice of dream yoga deepens our awareness during all our experience: the dreams of the night; the dream-like experience of the day; and the bardo experiences after death. 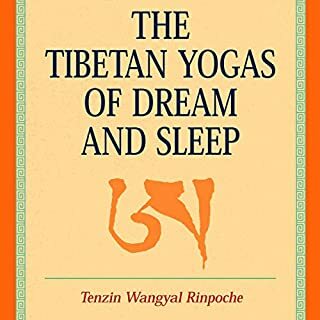 Indeed, the practice of dream yoga is a powerful tool of awakening, used for hundreds of years by the great masters of the Tibetan traditions. Unlike in the Western psychological approach to dreams, the ultimate goal of Tibetan dream yoga is the recognition of the nature of mind or enlightenment itself. 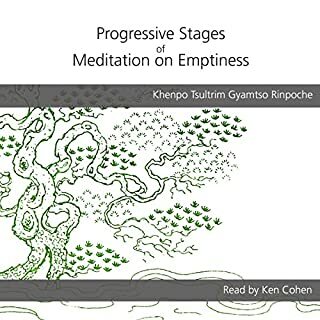 Progressive Stages of Meditation on Emptiness is a series of meditation practices on Emptiness, a particular aspect of the Buddha's teachings. The idea is that by beginning with one's first rather coarse commonsense understanding, one progresses through increasingly subtle and more refined stages until one arrives at complete and perfect understanding. Each stage in the process prepares the mind for the next in so far as each step is fully integrated into one's understanding through the meditation process. Spiritual disciplines often seem remote from the realities of our daily lives. Yet there is a Mahayana Scripture which presents a model of enlightened practice in the midst of urban living, the Vimalakirti Sutra. This teaches a non-dualistic wisdom and reconciliation of dichotomies. It challenges ordinariness and reveals systematic and effective ways of tapping higher potentials while upholding one's usual responsibilities and enriching long-term relationships. 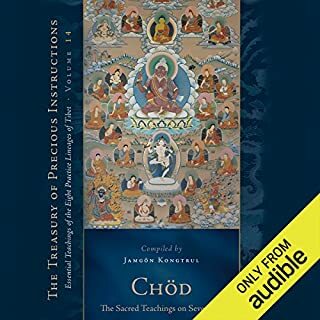 The Treasury of Precious Instructions by Jamgön Kongtrul Lodrö Taye, one of Tibet's greatest Buddhist masters, is a shining jewel of Tibetan literature, presenting essential teachings from the entire spectrum of practice lineages that existed in Tibet. In its 18 volumes, Kongtrul brings together some of the most important texts on key topics of Buddhist thought and practice as well as authoring significant new sections of his own. This Classic Course explores the unfolding of the genius and wisdom in each of us in the quest for the liberating insight into selflessness. In the context of our modern quest for a new vision of reality, Robert Thurman discusses the deepest issues of reality and non-reality, transcendent and the relative. Dr. Thurman's brilliant dissertation on the masterful works by the illuminated Lama, Tsong Khapa (1357-1419), on The Buddhist Theory of Relativity makes this an astounding must-have set of recordings. Colorful stories about and profound teachings of Patrul Rinpoche, one of the most impactful teachers and thinkers in the Tibetan tradition from the 19th century. Treasured by Buddhists of all traditions, The Way of the Bodhisattva (Bodhicharyavatara) is a guide to cultivating the mind of enlightenment and to generating the qualities of love, compassion, generosity, and patience. This text has been studied, practiced, and expounded upon in an unbroken tradition for centuries, first in India, and later in Tibet. Presented in the form of a personal meditation in verse, it outlines the path of the Bodhisattvas - those who renounce the peace of individual enlightenment and vow to work for the liberation of all beings. Robert Thurman's Basic Buddhism is a collective series of five lectures he has given on Buddhism. In these lectures, Thurman patiently takes apart each jewel of Buddhism: The Buddha as the teacher of enlightenment, the Dharma as the teaching, or enlightenment itself, and the Sangha as the historical and current community of learners seeking to become Buddhas. In the classic best seller, Introduction to Tantra, Lama Yeshe offered a profound and wonderfully clear glimpse into the sophisticated practices of Tibetan Buddhist tantra. This present book, the last major teachings of this great lama, opens up the world of advanced practices for Highest Yoga Tantra initiates in much the same way his earlier work opened up the world of tantra in general. Lama's own realization of the transformative power of these practices comes through, inspiring his students to discover for themselves their own capacity for inexhaustible bliss. the box that changed my life. Written in India in the early eighth century CE, Santideva's The Bodhicaryavatara takes as its subject the profound desire to become a Buddha and save all beings from suffering. The person who enacts such a desire is a Bodhisattva. Santideva not only sets out what the Bodhisattva must do and become; he also invokes the intense feelings of aspiration which underlie such a commitment, using language which has inspired Buddhists in their religious lives from his time to the present. The Life of Milarepa is one of the most beloved stories of the Tibetan people and a great literary example of the contemplative life. Jetsun Milarepa, the 11th-century Buddhist yogin and poet, started life as a black magician, gaining revenge for loss of heritage by casting terrible hailstorms and committing multiple murders. For more than 2,000 years, the Heart Sutra has been part of the daily life of millions of Buddhists. This concise text, so rich and laden with meaning, concentrates the very heart of Buddhism into a powerful and evocative teaching on the interdependence of all reality. In Essence of the Heart Sutra, the Dalai Lama masterfully unpacks the Heart Sutra so that any listener can benefit from its teachings - teachings meant to help us release ourselves from suffering and live with true compassion. Ricard has selected and translated some of the most profound and inspiring teachings from across these traditions. The selected teachings are taken from the sources of the traditions, including the Buddha himself, Nagarjuna, Guru Rinpoche, Atisha, Shantideva, and Asanga; from great masters of the past, including Thogme Zangpo, the Fifth Dalai Lama, Milarepa, Longchenpa, and Sakya Pandita; and from contemporary masters, including the Fourteenth Dalai Lama and Mingyur Rinpoche. One thousand years ago in the valley of Kashmir, a great Tantric master named Ksemaraja wrote his masterpiece: the Pratyabhijna-hrdaya, which means "The Essence of the Recognition Philosophy" - recognition, that is, of oneself as a direct expression of the universal divine Consciousness. Recognition also that this Consciousness is, in truth, all that exists, and that its five fundamental powers of awareness, enjoyment, willing, knowing, and acting are the sacred endowments of every sentient being. The 59 provocative slogans presented here - each with a commentary by the Tibetan meditation master Chgyam Trungpa - have been used by Tibetan Buddhists for eight centuries to help meditation students remember and focus on important principles and practices of mind training. They emphasize meeting the ordinary situations of life with intelligence and compassion under all circumstances. Slogans include, "Don't be swayed by external circumstances," "Be grateful to everyone," and "Always maintain only a joyful mind." In this modern spiritual classic, the Tibetan meditation master Chögyam Trungpa highlights the commonest pitfall to which every aspirant on the spiritual path falls prey: what he calls spiritual materialism. The universal tendency, he shows, is to see spirituality as a process of self-improvement - the impulse to develop and refine the ego when the ego is, by nature, essentially empty. "The problem is that ego can convert anything to its own use," he said, "even spirituality." Dr. Neale presents a seven-session audio course to immerse you in the teachings and practices of the Lam Rim - Tibetan Buddhism’s time-tested path for psychological maturity and awakening. Created as an audio companion to Dr. Neale’s book Gradual Awakening, this course brings you a guided experience in the traditional Lam Rim journey, updated with insights from science and psychotherapy to root each step in our modern experience. Tibetans call their cherished tradition of Buddhism a "wish-fulfilling jewel tree" for its power to generate bliss and enlightenment within all who absorb its teachings. This path to enlightenment, it is taught, requires more than a sitting meditation practice alone. 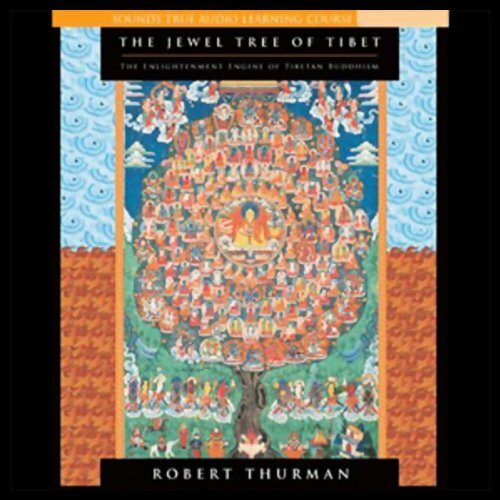 With The Jewel Tree of Tibet, honored scholar and teacher Robert Thurman brings these insights to you as they were meant to be transmitted, through the spoken word. As a young seeker almost 40 years ago, Thurman first journeyed to Dharamsala, where he became the first Westerner ordained by His Holiness the Dalai Lama. Now, Thurman guides you lucidly through the unifying principles of Tibetan Buddhism's many branches. You will discover Tibetan Buddhism's detailed map of the "bliss state of enlightenment", the principles of tantra for opening the doors to "infinite compassion and continuity", and how to overcome the dangers of the spiritual quest to discover states of consciousness that transcend even death. 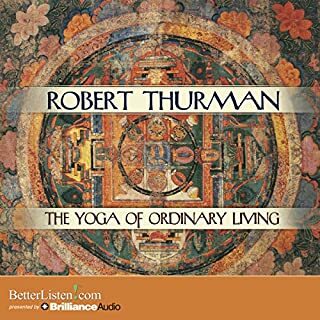 Finally, here is Robert Thurman on audio, offering a rich and intellectually riveting retreat program, complete with many specific meditations and spiritual practices to fully immerse you in the mysteries of The Jewel Tree of Tibet. More than nine hours of compelling study with one of Tibetan Buddhism's greatest teachers. Guided meditations to experience the blessings of "the wish-fulfilling gem tree"
Hear more from Robert Thurman. 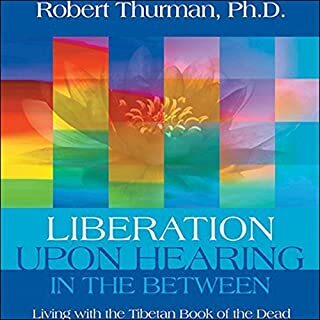 I'm a big fan of Bob Thurman, but when I first started listening to this book, I was slightly put off. A lot of exaggerated imagery about gems, rubies & diamonds & sapphires hanging from a tree, yeah yeah, we get it: The Three Jewels. But there's something about listening to Bob Thurman speak that makes me unable to abandon anything he's speaking about, so I continued on. Eventually I warmed up to the "magical talk" and understood it to be symbolism and got over it. Plus, his enthusiasm and strange accent are very engaging. The second half of the audiobook was MUCH more interesting and got into the practical things like practice, that I was hoping for. The next time I listened to it, I picked up on many things I had not the first time around, and I was surprised. I guess I needed a warm-up run. Then I listened to it a third time, and again, got even more from it. So overall I am glad that I bought it. But for anyone who listens to it the first time and is slightly put off, I would really recommend hearing him out. He does go somewhere, and it is worth the wait. I really enjoyed this book and found the teachings very helpful and beautiful. It may be too much for a beginner, but if you already have some Buddhist background you will probably find this book well worth your time. I plan to listen to it again because I know there is more than I could possibly get on just my first listen. Thurman breaks down the essential daily practice of Tibetan Buddhism into a wonderfully simply set of steps - literally the enlightenment engine - of how to practice. His genius is taking what can otherwise be difficult concepts and making them understandable, actionable and ... beautiful. Its not necessarily for the beginner but it can be. It is well worth the effort, giving the thoughtful listener essential tools for living an enlightened life. Highly recommended. Hang with it, it's worth it! Fantastic! A bit advanced, as others have said here, but regardless of your level, this listen has so many "jewels" that it's worth listening to many times! I would recommend this to those who have studied Buddhism some and have a fairly good handle on some of the big concepts. This teaching is pretty dense and quick. It is also fantastic. I will have to listen to this a number of times for it to sink in. I am super glad I got it--a good value for 1 credit. I am an more advanced practitioner, and love to listen while I work (draw. He is clear, he is inspiring, he is open, he is gracious -- truly a wonderful listen! I will listen again and again . . .
His wonderfully expressive reading, his proper pronounciations, and his short chants add to the enjoyment. It also has been enjoyed by members of my family who are beginners on the path, or others who are not necessarily interested in Buddhism. While he's a great speaker and I loved this, i think I will come back to it after doing more research and gaining a better understanding. There was a lot more than I would have liked that went right over my head. If you are new to Buddhism you, like me, might start with something a bit more basic then come back to this. Robert Thurman is the master, at least in the USA. He presents a very open-minded approach to Buddhism that even the non-religous or people from other religisons can appreciate and take pieces from to expand their mind and live a calmer and more balanced life. I cannot rate this highly enough as I can't take it all in yet! There is depth and clarity and genuine teaching here - worth every single penny - truly a masterpiece and I thank the author for making the effort to teach this. Wonderful. wonderful narrator - wonderful message. Wonderful narrator - wonderful message. Interesting, immersive and relevant. I would recommend to anyone wanting an insight into Buddhism's interconnectedness. Amazing clarity with deep knowledge. I enjoyed learning more about Tibetan Buddhism and the meditations and visualisations led by the writer were of interest. I was frustrated by his continued reference to other religions, e.g. "You can visualise the Buddha, or Christ, or Allah," etc. I understand that he was trying to make his retreat inclusive (and indeed this is not an audiobook, it is the recording of a retreat), but it did not match what I was hoping to hear about. Also, there did not seem to be a clear thread of information; instead, the text meandered from one topic to the next and one idea to the next. He is clearly very knowledgeable and experienced, and I gained from listening to much of it. Although there is a lot of good information contained in this book the dubious lineage and choices of it's author, Professor Thurman bring doubt as to the motivations of his work. Without the guidance of a full qualified teacher who has not broken lineage to the root guru, Buddha Shakyamuni, any work may contain damaging or at least unhelpful advice. If you still wish to purchase this, please cross-reference the material against other sources not necessarily linked to Thurman's lineage, such as other Gelug-pa lines of Venerable Trijang Lobsang Yeshe Tenzin Gyatso. 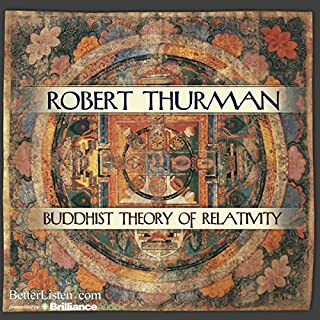 Thurman has such an in-depth knowledge of Tibetan Buddhism which he communicates in a fluent manner which engages the listener totally. There are so many complex layers in this presentation which Thurman succeeds in conveying with great clarity. The perfect antidote to those superficial books on Buddhism which repeat the same old information. Thurman moves the listener into new and unexplored territories of spiritual enlightenment.